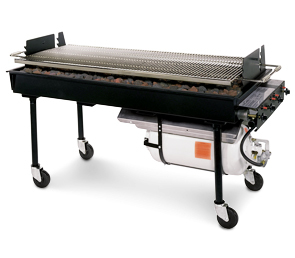 Safety, Durability and Profitability are trademarks of this Award-Winning PORTA-GRILL® II. The entire unit is self-contained with a 40 lb. fuel cylinder included. 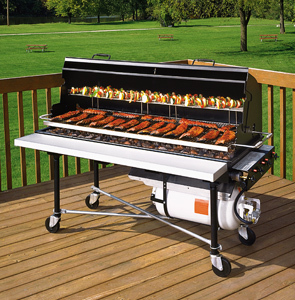 The grill is supported by four sturdy legs made from 1-5/8"O.D. structural pipe taper threaded, for quick fastening to firebox. The base of the legs with 5" casters allow the grill to be mobile over short ranges, while the two casters with step-locks keep the grill from rolling away. (4) Individually Adjustable Stainless Steel Burners. Heat Range up to 150,000 BTU's. (No Batteries, Wands or Matches Required). 10 Sq. Feet of Cooking Area. Includes 40 lb. Propane Cylinder with Overflow Protection Device. PORTA-GRILL" II provides the kind of safety and peace of mind that only a gas grill manufactured to the highest known safety standards can offer! Belson's cross-tie ignition system is a safety feature that alleviates the potential for any gas build-up that could result from an unlit burner. If by some chance one of the four burners extinguishes the cross-tie from an adjacent burner automatically reignites it. "Cool-Grip" safety handles allow for easy adjustment between the four different cooking heights. Note: All figures are based on a gas grill. Counts and times can vary with size. Firebox is constructed from 1/10" thick (12 ga.) steel with extra heavy-duty 4-1/4" x 3/16" steel plate reinforcement. Coating is a non-toxic, heat-resistant, flat black enamel finish. The sanitary nickel-plated cooking grate is constructed from 1/4" & 1/2" round steel bars with 'U' channels welded to both the front and back edges for maximum strength.